Although not as popular in the world as cheese and chocolate, the sausages and meat delicacies are among the products Switzerland is proud of. 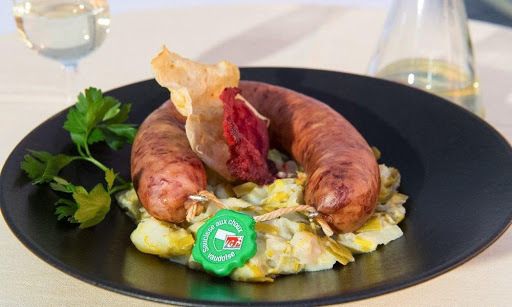 Each canton in Switzerland has its own sausage or delicacy, which is made only of animals farmed in the region and with spices that grow there, and every Swiss family has its own recipe that is passed on from generation to generation. We start our delicious „walk” through Switzerland with the „Queen” or with the National sausage of Switzerland – Cervelat. Cervelat is a type of smoked boiled sausage that is prepared of equal parts of beef, pure pork, pork fat meat and spices. The meat is minced very finely, then the spices are added to the mixture and all this is filled into natural casings. Once the sausages are filled in the casings, they are smoked for about an hour at 65 – 70 degrees in special smokers, and finally they are cooled down. The Swiss sausagesе Cervelat can be consumed in many ways – grilled with fresh salad, fried (filled with cheese and wrapped in bacon), boiled or roasted on fire. Cervelat is considered to be the national Swiss sausage and anually are produced (and eaten) about 160 million sausages or, on average, 25 sausages a Swiss per year. In 2006, Switzerland banned the import of natural casings from Argentina and Brazil. This reduced the production of Cervelat, which caused the dissatisfaction of the Swiss who were worried that their national sausage will disappear. It all ended when in 2012 the Swiss government cancelled the ban. Although Cervelat is produced not only in Switzerland, but also in Germany and Italy, the birth place of the delicious sausage is St. Gallen. Bündnerfleisch is the most popular meat Swiss delicacy, which has received the protected geographical indication statute. The delicacy has been prepared for centuries in the Grison area and only pure beef (without any fat) is used for its preparation. 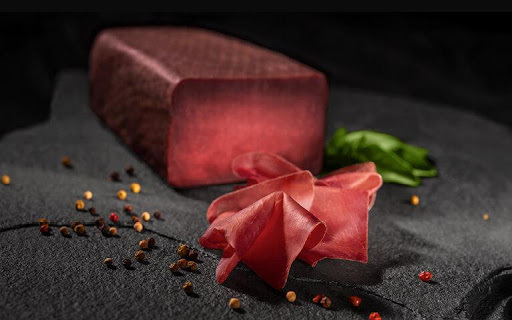 The delicacy is still produced by hand, as the prepared pieces of pure beef are rolled into salt, Alpine herbs and a mixture of spices, which is a trade secret of any manufacturer. Then the pieces are placed in special containers and stored for several weeks at low temperatures. After this phase, the meat is removed from the containers and put in nets to dry in the fresh air of Grison. Traditionally, Bündnerfleisch is consumed cut into thin slices and seasoned only with a pinch of black pepper. Its unique flavor unfolds best if consumed with a piece of Parmesan cheese, some olive oil, a slice of crunchy toasted bread and a glass of wine. This is one of the Swiss sausages that are produced in Geneva. Longeole is a type of raw sausage of pork meat with strong flavor of dill. The sausage has the status of Protected Name and it can only be produced in the region of Geneva canton. Longeole is a thick sausage weighting from 250 to 650 grams. It has red color, as its structure is rough and minced in big pieces. It is made of 1/3 pork meat, bacon and fat, which are minced in big pieces, then seasoned with salt, dill and white pepper. The mixture is filled into natural casings (pork or bovine), then sausages are tied with a red-yellow thread (these are the colors of the coat of arms of the Geneva canton), and finally they are left to dry at room temperature for about 12 hours. This type of Swiss sausage is neither smoked nor dried. In general, the whole process from the preparation of the meat to the consumption is about 36 hours. Before consumption, Longeole has to be boiled in order to release its taste qualities, and above all, the scent of dill. It is consumed cut into large pieces with a garnish of potatoes (fried, salad or cooked). Appenzellese is a region in Switzerland where one of the best cheeses in the world – Appenzeller is produced, but now we are not going to talk about Swiss cheeses, but about three of the most popular Swiss sausages that are produced in the canton of Appenzellese. All three meat delicacies Appenzellese Mostbröckli, Appenzeller Pantli, Appenzeller Siedwurst have the Protected geographical indication status. Appenzellese Mostbröckli is a meat delicacy made from beef, dried and smoked. The shape of the delicacy is round and its taste is distinctive and spicy. Appenzeller Pantli is a raw sausage, which like Mostbröckli is produced from beef. Appenzeller Pantli is dried until it reaches the desired weight loss (it is similar to our product flat sausage). The sausage has elongated, flattened shape and it has a strong flavor of garlic. Appenzeller Siedwurst is a fine cooked sausage with a distinctive taste of cumin and garlic. As no salt is added during its production, the color of the sausage is light, almost white. Appenzeller Siedwurst, like the white sausage of Munich, shouldn’t be consumed fried, nor baked, but it should be consumed only boiled. It is important to remove the peel of the sausage immediately after you remove it from the boiling water. Traditionally it is consumed with potatoes salad or only with bread. Saucisse aux choux is smoked sausage of the Vaud canton, which since 2000 has been granted the status of Protected name of origin. The special thing about this Swiss sausage is that it contains not only pork meat, but also blanched cabbage. Tender pork meat, bacon, greaves or liver, tongue, head of the pork are minced, and then to the mixture are added the blanched chopped cabbage, salt, garlic, nutmeg, coriander, anise and clove. The mixture is then filled in natural casings, tied and the sausage undergoes cold smoking with wood chips. Saucisse aux choux has a horsehoe shape with length of about 30 cm and weight between 300 and 400 grams. The color of the sausage is golden brown, inside it is pink and with fine structure, as its flavor slightly hints the aroma of cabbage. The sausage is consumed after scalding in warm water. Usually it is used for the preparation of a stew of leeks, potatoes, onion and white wine. We can’t miss one of the most delicious and popular Swiss sausages OLMA. St. Gallen Bratwurst OLMA is a white, finely cooked sausage from the canton of St. Gallen, which is popular not only in Switzerland, but around the world and because of that a large part of the Swiss consider St. Gallen Bratwurst to be the national sausage of the country. The sausage is made from pork, veal, fat, milk, ice. If the veal content is more than 50% then the sausage is called St. Galler Vealbratwurst. The meat and bacon are finely minced, then seasoned with salt, black pepper, ginger, leeks, celery, parsnip and other spices. The mixture is filled in natural casings, then the sausages are boiled for about half an hour at a temperature of 70 – 75 degrees. St. Gallen Bratwurst OLMA is consumed fried or grilled, but without mustard. To put a mustard on the OLMA sausage is considered by the Swiss a bad thing.